The Jellyfish Vases are made from ultrathin transparent silicon, which has been dyed twice to make it look like it is just a sillhouette when submerged in its water-filled display. Through its design, Japanese studio Nendo hoped to redefine the conventional role of a vase. The installation, hosted at the Jil Sander store in Milan, will feature both flowers and vases floating inside the tank. The strength and direction of the water's current will change, so that the vases undulate gently along the bottom of the tank like slowly moving jellyfish. "The design was to redefine the conventional roles of flower, water and vase by making the water inconspicuous, with an ensemble of both flowers and vases floating inside the filled water, as opposed to simply showing off flowers in a water-filled vase," said Nendo. 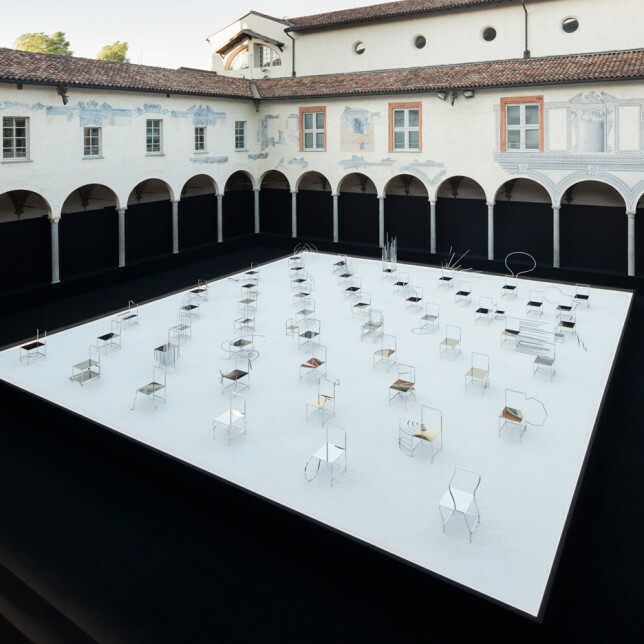 The installation forms part of Nendo's Milan exhition, titled Invisible Outlines, which takes place from 4 to 9 April at the Jil Sander showroom on Via Luca Beltrami. Here, an additional 16 works will also be on show for the first time, including collaborations with Alias, Cappellini, Flos and Glas Italia.